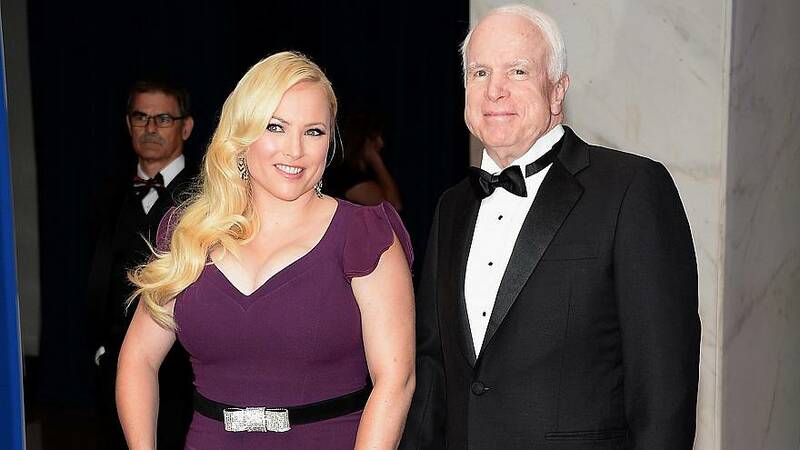 Meghan McCain unloaded on President Donald Trump on Wednesday, calling his latest broadside against her late father, Sen. John McCain, a "bizarre new low." "I think if I had told my dad, 'Seven months after you're dead you're going to be dominating the news and all over Twitter,' he would think it's hilarious that our president was so jealous of him that he was dominating the news cycle in death as well," McCain said on ABC's "The View." Trump criticized the Arizona lawmaker on Tuesday during an appearance at the White House alongside Brazilian President Jair Bolsonaro, telling reporters that he "was never a fan of John McCain and I never will be." Trump said that he still found it "disgraceful" that John McCain, the 2008 Republican presidential nominee and a former prisoner of war, voted against repealing key parts of Obamacare in 2017. McCain died in August 2018 after a battle with brain cancer. Trump also lashed out at John McCain last weekend, accusing him of sending a Trump opposition-research dossier compiled by former British spy Christopher Steele into the hands of multiple media outlets in late 2016. McCain gave a version of the dossier to the FBI in December 2016, after the presidential election, and asked if any of it was true, but he had denied being a source of the document for BuzzFeed, which published it in January 2017. During the 2016 campaign, Trump claimed the Vietnam veteran was "not a war hero" because "he was captured." As Trump continues to attack the late senator, longtime John McCain allies and some Republican lawmakers have hit back. "I just want to lay it on the line, that the country deserves better, the McCain family deserves better. I don't care if he's president of United States, owns all the real estate in New York, or is building the greatest immigration system in the world," Sen. Johnny Isakson, R-Ga., told The Bulwark, a conservative news site, in an interview published Wednesday. "Nothing is more important than the integrity of the country and those who fought and risked their lives for all of us," Isakson added. Senate Minority Leader Chuck Schumer, D-N.Y., said Wednesday that he plans to re-introduce legislation that would rename a Senate office building after the Arizona Republican. "I look forward to soon re-introducing my legislation re-naming the Senate Russell Building after American hero, Senator John McCain," he tweeted.